I had the Brier and the women’s worlds on TV in the background for the last couple of weeks. Goes perfectly with geekdom! Then curling deserves far more respect than it gets. The ludicrous degree of precision needed by a skip to hold an end together is simply startling. What network was it on? Damn, I would have really like to watch it, just no idea it was actually happening. I was addicted to it the last Winter Olympics. Eurosport carries it in Europe, not sure about the US. You can follow it live on teh intertubes though (available everywhere except Canada). …and in Canada it’s on TSN. And TSN HD. and, of course, we won. har, har. 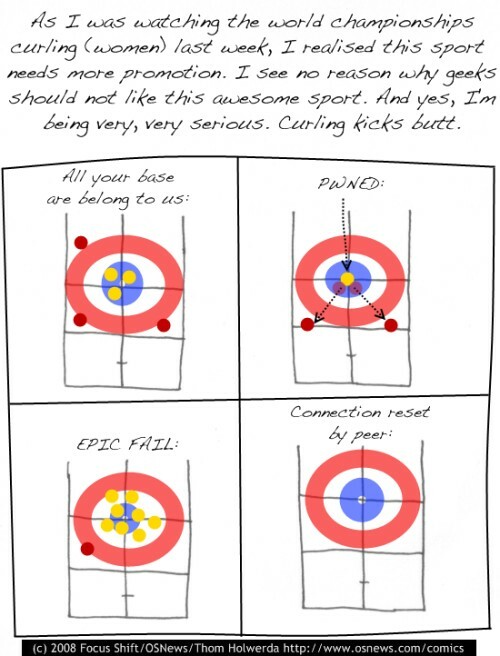 Geeks will never approve of curling. They already have enough experience with having to use inappropriate tools to perform inhumanly exacting tasks in short amounts of time in their day jobs. There’s two excellent 3D curling games for windows, Take-out Weight Curling and the sequel Take-out Weight Curling 2. Of course it may be hard to find as neither title is made anymore. Excellent games that give you a chance to try it without having to be on real ice. We get CBC on our cable. Its the only sport that the wife and I will watch together. I still miss Sandra Schmirler.